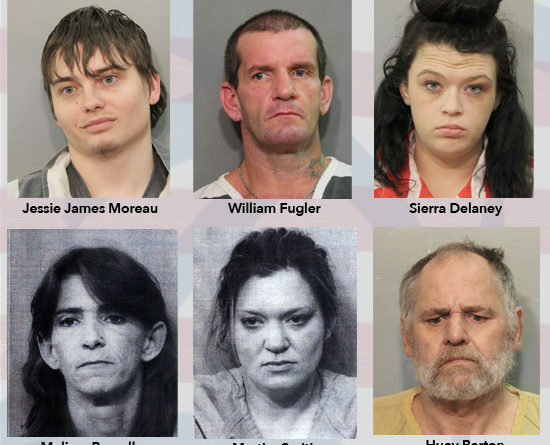 GRANT DEPUTIES REPORT SEVERAL ARRESTS IN UNRELATED INCIDENTS. A BREAK-IN IN THE POLLOCK AREA RESULTS IN THE ARREST OF 32-YEAR-OLD MARTHA SMITH AND 41-YEAR-OLD MELISSA BREVELLE, BOTH OF POLLOCK, ACCUSED OF BURGLARY, TRESPASS, POSSESSION OF STOLEN THINGS AND CRIMINAL DAMAGE. A TRAFFIC STOP RESULTS IN THE ARREST OF A WINNFIELD MAN FOR CRYSTAL METH. DEPUTIES SAY THEY WERE LOOKING FOR A WANTED PERSON WHEN THEY REPORTEDLY FOUND A CONVICTED FELON IN POSSESSION OF GUNS, 47-YEAR-OLD WILLIAM FUGLER OF COLFAX. AND, A DRY PRONG COUPLE IS ARRESTED FOR METH AND AN ILLEGAL FIREARM. THEY’RE 21-YEAR-OLD JESSIE JAMES MOREAU AND 34-YEAR-OLD SIERRA DELANEY.